It’s official. The first snow came yesterday. We can now enjoy wintery comfort food without being scorned. When I was a kid, my mom made all of our bread. Generally, she made whole wheat loaves and sometimes white braided breads for special occasions. Her home made breads were so good out of the oven. This must be where my love of breads originated. 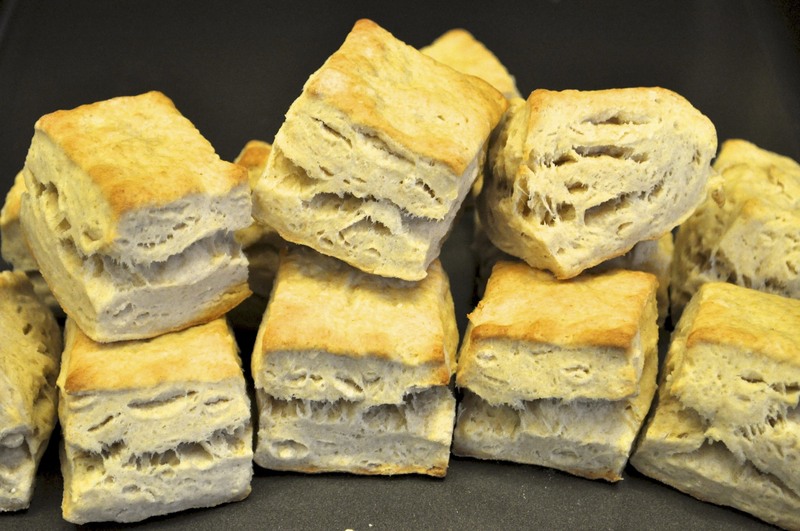 When I moved out on my own, I tried making biscuits that came out of a refrigerated can. Those were ok. That was the sum of my biscuit experience. After a conversation about biscuits with my friends at work, I was inspired to try my hand at some. Who knew you didn’t need a box of Bisquick to make biscuits?! My first batch came out buttery and delicious. After cutting perfect round biscuits, I kneaded the leftover dough and cut the last batch. I learned that kneading them again caused them to not rise as well as the first batch. I’ve also learned that biscuits don’t have to be round. I cut the next batch into squares, and voila! a perfect batch of biscuits. Since that experience, I’ve made batches of biscuits. They only take 1/2 hour and they taste wonderful with our homemade cloudberry jam. Yum! I’ve read I can use the biscuit dough as a base in muffin cups and stuff the biscuits with anything my heart desires. If that isn’t enough, I can imagine what could get baked right into the biscuits…herbs, cheeses…oh, boy!